Hi, new user, though been browsing for a while. Basic background info: I'm 42 years old, used to be very overweight & sedentary, but lost about 6 stone (84lbs / 38kg). Completely new to gymnastics, but since January 2017 I've been learning to handstand, purely for fun/fitness/sense of achievement. 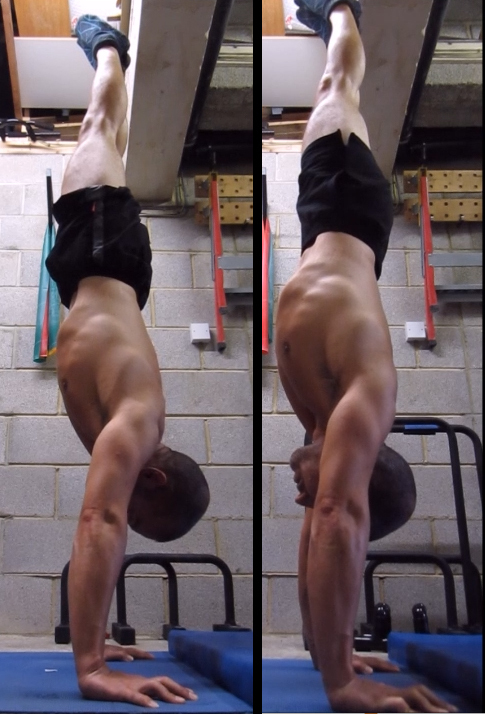 Between January and now, I've gone from not being able to handstand at all, to being able to regularly hold a handstand for about 40 seconds, with a current "best" time of 1 minute, 1 second. With that said, I'd really appreciate some advice on how to improve the consistency with which I can kick up into a handstand. I know my form isn't good - my shoulder flexion is poor, as is my wrist mobility. I am working on improving both of those, but it's very slow going. I thought it would just be a case of practice, practice, practice until the muscle memory becomes second nature, but that just doesn't seem to be happening. Could anyone please give me some pointers on how to improve this? Try kicking up with straight legs and getting close to a wall, so that you cannot go over backward. A great drill is kicking up close to a wall while trying not to touch it. The closer to the wall you are, the more difficult it will become. Thanks for the advice; I thought I had progressed past wall handstands and should focus on free standing balance, but maybe I wasn't as ready as I thought. I've now gone back to the wall. Regarding kicking up with straight legs, in my mind my legs feel dead straight - to the point where I would absolutely swear they were straight, and it's only from recording video that I realized just how bent they were! Is the key to keeping legs straight just to tense the muscles as hard as possible and mentally focus on them? Is the key to keeping legs straight just to tense the muscles as hard as possible and mentally focus on them? Yes, this has to become a habit. Consciously keeping tension through your entire leg is the best way to continuously keep them straight. This is something that is constantly being emphasized in GST. Just wanted to post an update on my progress. I've been mainly focusing on keeping my legs straight during the kick up, and also using more core control to hold a straighter line. As suggested I've been mainly doing this against the wall - or rather near the wall, and only touching it if I lose balance, or kick up too hard (don't want to rely on leaning against the wall). My kick up consistency is definitely improving. It's still *far* from 100%, but I can get my balance noticeably more often, and it's feeling more due to control rather than luck. My legs still refuse to stay totally straight during the kick up even though I'm really focusing on them, but I can feel and see from the video that it is improving. My shoulder mobility doesn't feel to have improved, but I'll continue to work on it. I strongly suggest that you purchase Handstand One for more bodyline drills for your alignment and to improve your handstand even more. Leo had some great tips for you another one I would like to add is try practising your handstand without your shoes on. This will help you get some proprioception from your feet which will assist you with being able to kick up and then hold a nice tight body line whilst in a handstand. Other than what is already mentioned as your overall "Core", wrists, and forearms become stronger your initial kick up balancing will improve. Just wanted to say thanks and post another update. - Focusing more on keeping my legs straight in the kick up, and keeping my core tighter so my back doesn't arch over. - Maintaining this tension once balanced, and remembering to point my toes and really try to stretch out my body by reaching my toes up into the air, and my shoulders into the ground (Leo's advice of imagining my body being stretched by string really helped with this!). - Replaced my regular shoes with thin, flexible gym sock/shoe things which really helps with keeping my legs together and pointing the toes. The result has been a fairly significant improvement in the consistency of my kick up. I now successfully get into a handstand WAY more often, and feel a lot more in control. When I do fail, it's usually from not kicking up with enough momentum, so I come back down onto my feet. Significantly, I almost never "over kick up" and topple over onto the crash mat, which I used to do a lot. And when I do, I have a much better understanding of what I did wrong. Over the next month my goals are to solidify the improvement in form, improve the kick up consistency even more, and add some shoulder strengthening exercises to help increase my max hold time. Really wish I'd got into gymnastics decades ago! But at least I found it at 42, so could be worse. Hey Mark , your journey to the straight line will be very long. you can speed up the process with the Thoracic spine stretch course.